In 1984, Alla and Allan Wolf-Tasker embarked on a massive journey to create a little piece of paradise in the regional town of Daylesford. 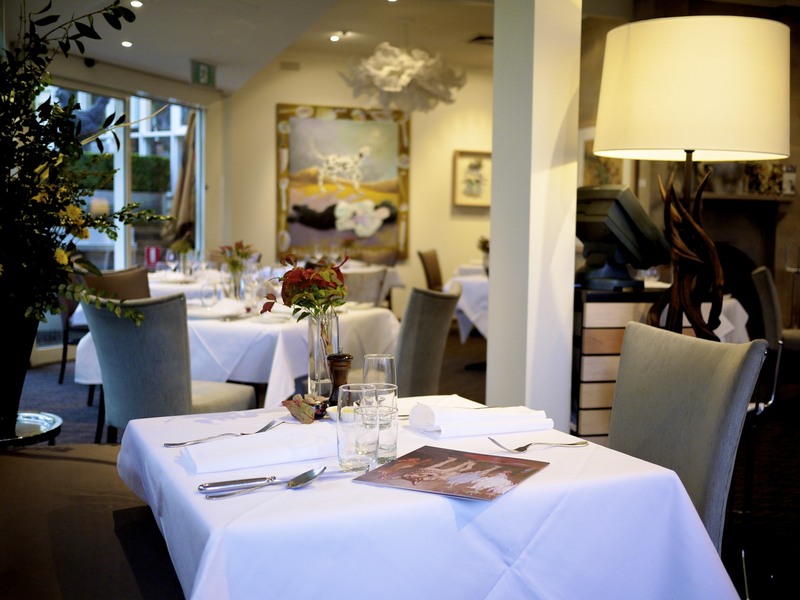 30 years on, not only have they become a gourmet destination in Australia having been nominated again the Best Regional Restaurant in 2014, they have also been listed in the UK Tatler’s 101 Best Hotels, as well as having the Best Country Wine List. With so many accolades to their name, including their famous spa (after all they are in spa country), my wife and I decided not do this half heartedly but embrace the experience in its entirety. Our stay could not have commenced better after we were informed that we had been upgraded to a Waterfront Suite (from the Waterfront Room). 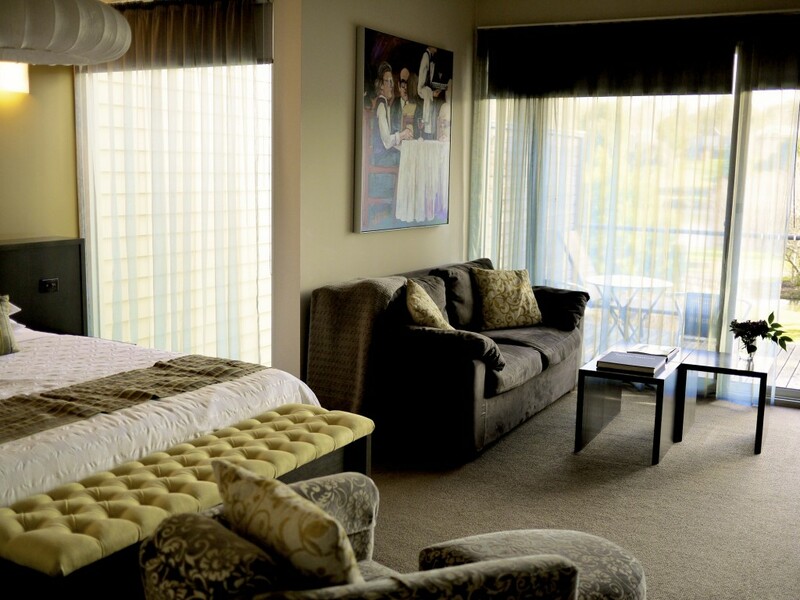 It was a very comfortable room with an unobstructed view of the lake. I made the most of our upgrade by soaking in the enormous spa bath in our bathroom whilst my wife indulged for a couple of hours at their resident spa before dinner; a perfect segway to dinner. 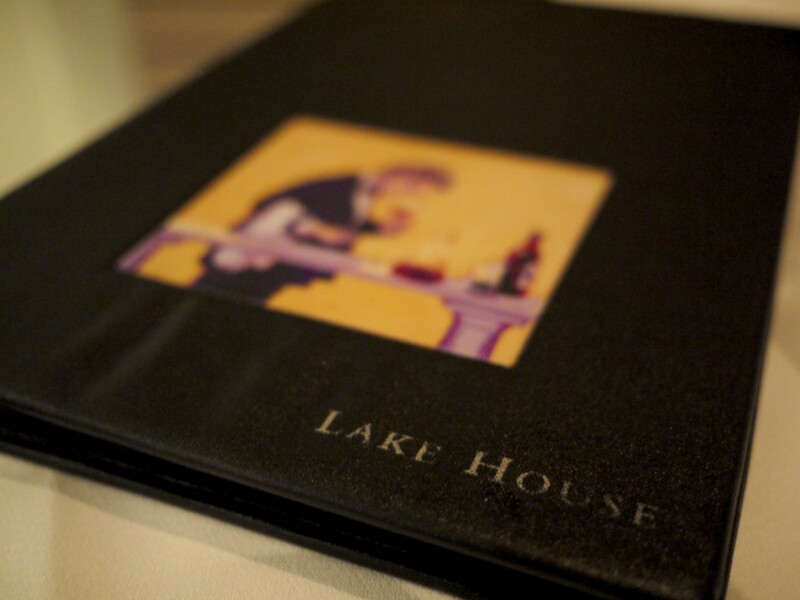 We arrived into a buzzing dining room led by one of the many French staff that worked at the Lake House. We were seated right by the kitchen door, although admittedly I was very envious of the people sitting by the window on the comfortable sofas. On to the menu and it was a rather difficult choice. Our package included a three course a la carte option already but we had the option to upgrade to a full tasting menu for a small fee. I was hoping to go with the full tasting menu whilst my wife stuck with the three course option. Unfortunately, contrary to the experience shared by other foodies, we were told the tasting menu was an all or nothing affair and I therefore, unable to convince my wife of the merits of the upgrade, was stuck with the three course option. My first encounter with sparkling wine from the Macedon Ranges (see previous post) completely blew me away so I couldn’t resists trying the house Lake House Rosé by Cope-Williams, NV. Macedon Ranges, Victoria. For bread we had a bowl with a selection of sourdough and slices of home made baguette. The sourdough, which was sourced from Basilio, had a good airy texture but the baguette was lacking in salt and thus flavour. 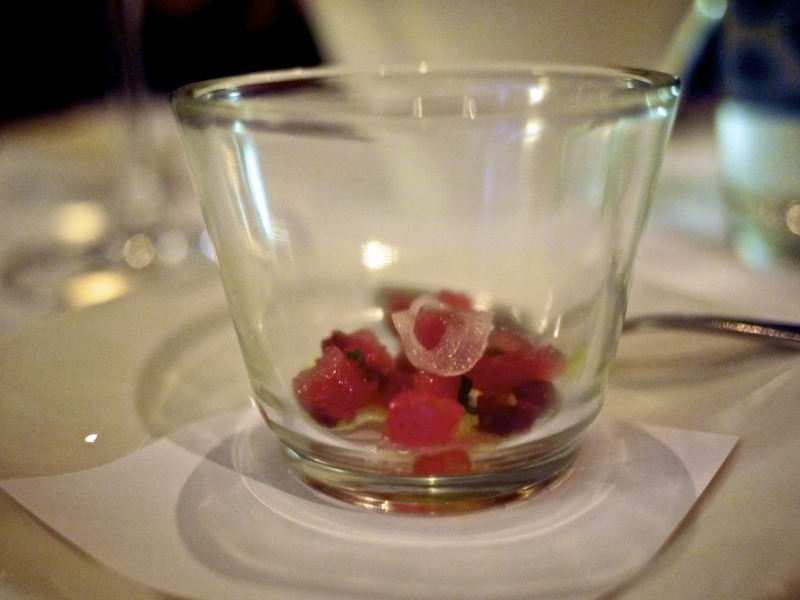 We began our dinner with an amuse bouche of Air-dried tuna, shallots, tomato and cucumber. The air dried tuna had been dusted in what appeared to be paprika to give the dish a surprising element of heat. Fresh ingredients and lovely contrast of textures from the crunchy onion to the meaty tomato cubes and chewy fish that reminded me of the Asian dried fish. We were getting very hungry. One of the wine that was being offered by the glass caught my eyes when the pairing was being discussed with the sommelier. 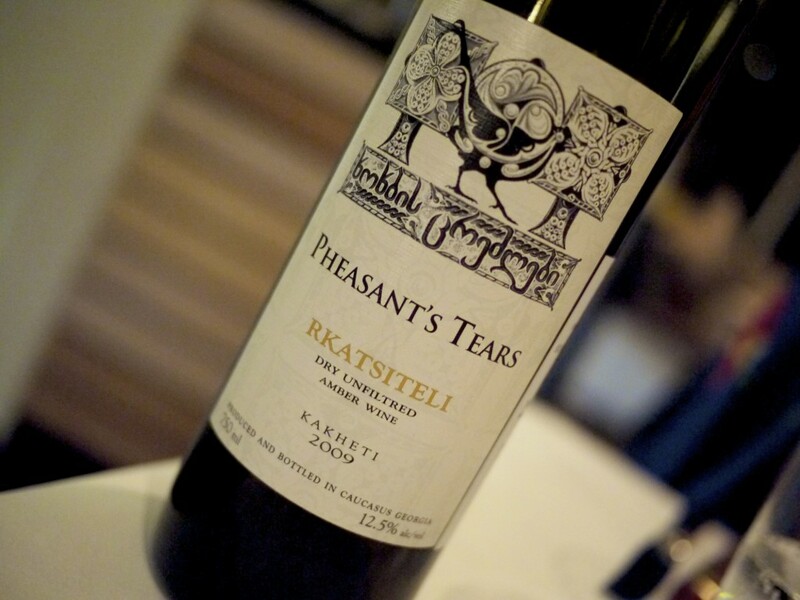 I was strongly recommended to try the amber wine of 2009 Pheasant’s Tears, Rkatsiteli, Kakheti, Georgia, which had a spicy nose with a unique peppery fino-like note. The biggest surprise was the grippy tannins and lingering flavour. Not a wine to drink on its own but went quite well with my first course. 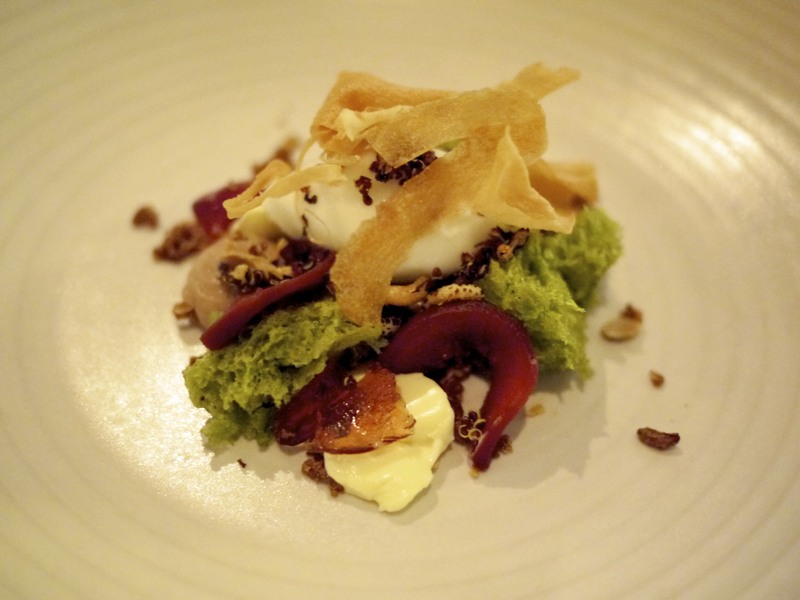 … the Glazed kingfish, buckwheat noodles, miso mustard sabayon. It would be unfair to knock this dish because the balance of flavours and overall composition was actually more elegant than my dish with every component working in subtle harmony, highlighting the flavour of the fish. 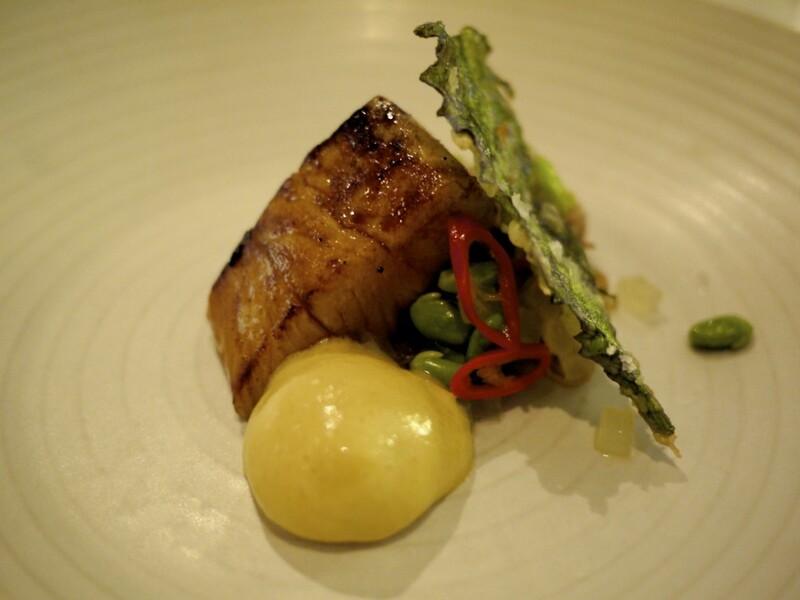 The miso mustard sabayon was light, silky and perfect for the glazed fish. The crispy buckwheat noodles completed the trifecta with the textural contrast and there was a lovely level of heat coming from the slices of red chili. What a superb first course all round! 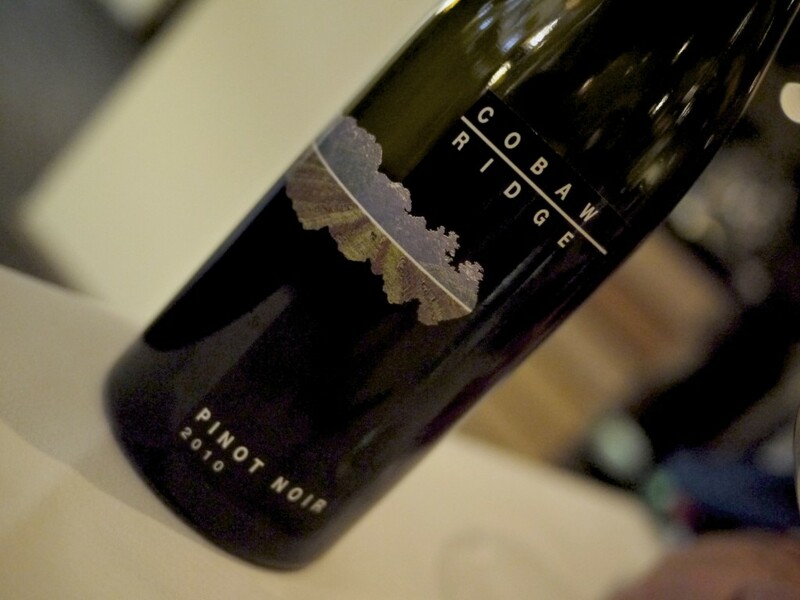 For the next course the sommelier recommended the 2010 Cobaw Ridge, Pinot Noir, Macedon Ranges, Victoria. I was open to trying something new and given Cobaw Ridge was the only unfamiliar one on the options by glass, I obliged. Whilst it was a fine drop, I must confess it wasn’t my type of pinot noir as I found it rather too spicy on the nose and palate for my liking. 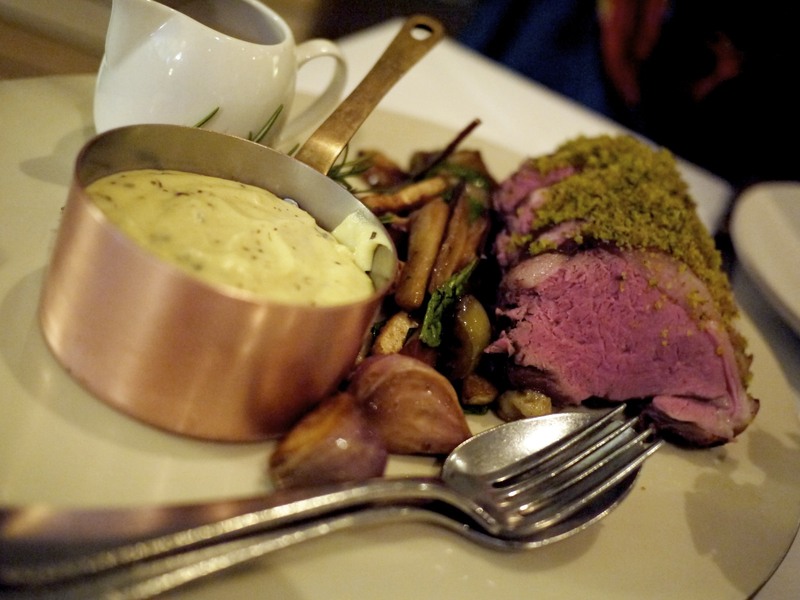 We normally have a rule of choosing different dishes but we couldn’t turn down the Flinders Island roast leg of saltgrass lamb, truffled pommee purée, winter accompaniments that required a minimum of two persons. It was served with a thick delicious jus on the side. The crime here was that, sadly instigated by us, the kitchen had to cook the meat closer to well done as my wife was pregnant. As a result the meat was slightly dry, although the herb crust on the outside and the jus more than made up for the compromise. My wife did not waste time in tucking into the truffled pomme purée, having missed out the truffle in round one. 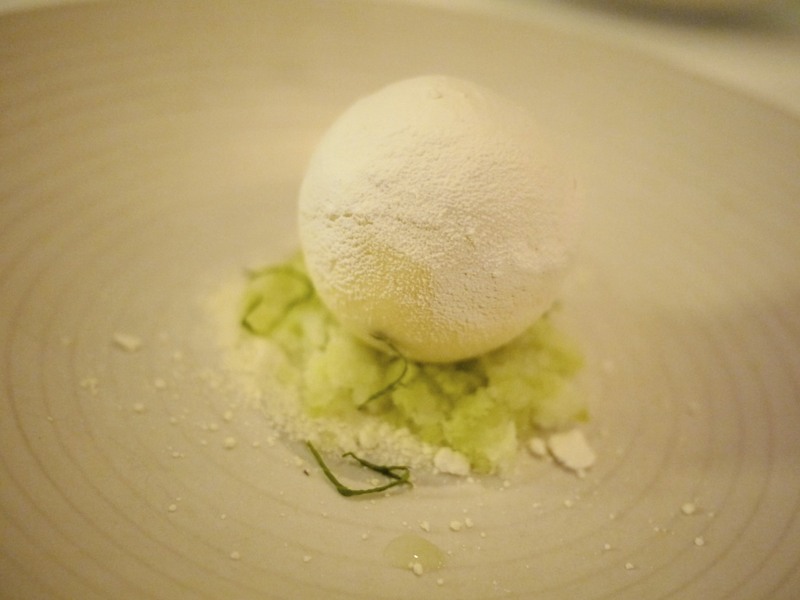 … the inside was filled with buttermilk, walnut and an apple and cidre jelly. 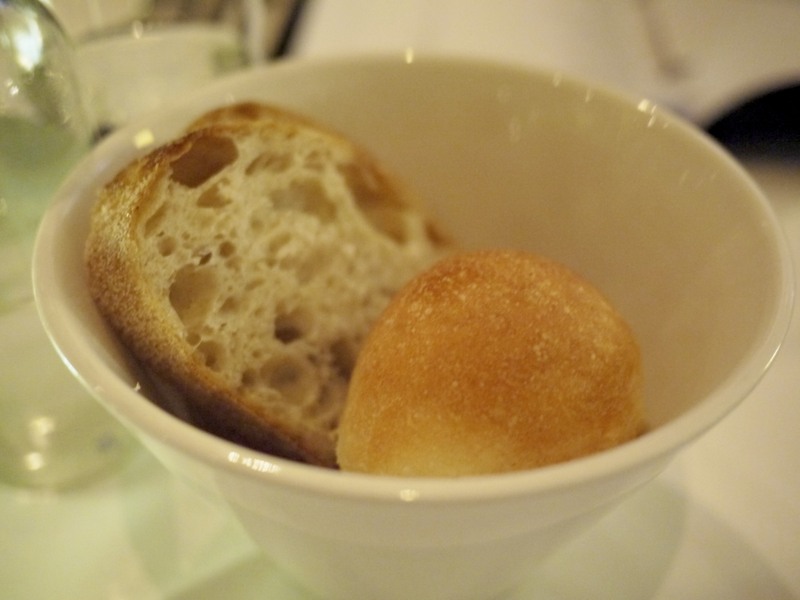 It had a good acidic sharpness to the dish with an inviting aromatic scent and was not sickeningly sweet at all. My wife was yet again filled with food envy. She opted for A winter’s ramble – seeds, nuts, quince, honey, parsnip, chocolate. 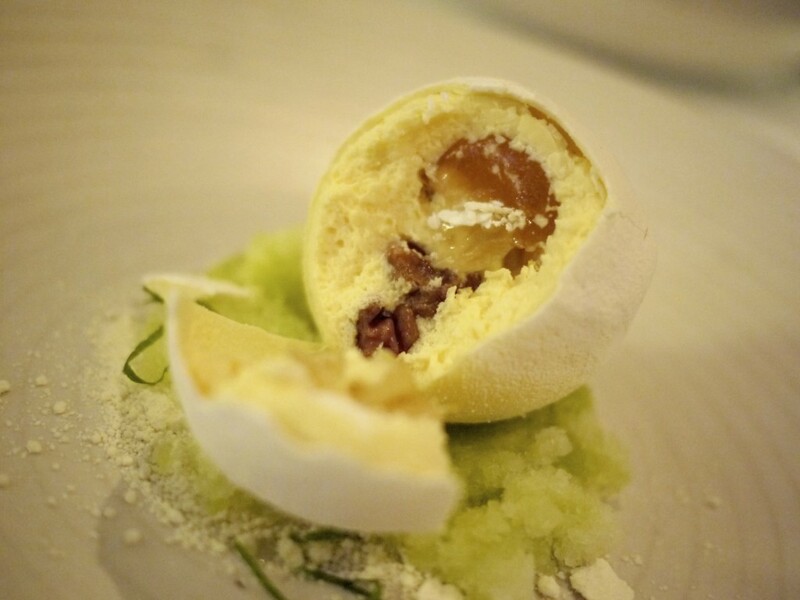 This was a much more subtle dish with an interesting play on texture using, unusually for a dessert, seeds and nuts to contrast the soft sponge and quince. 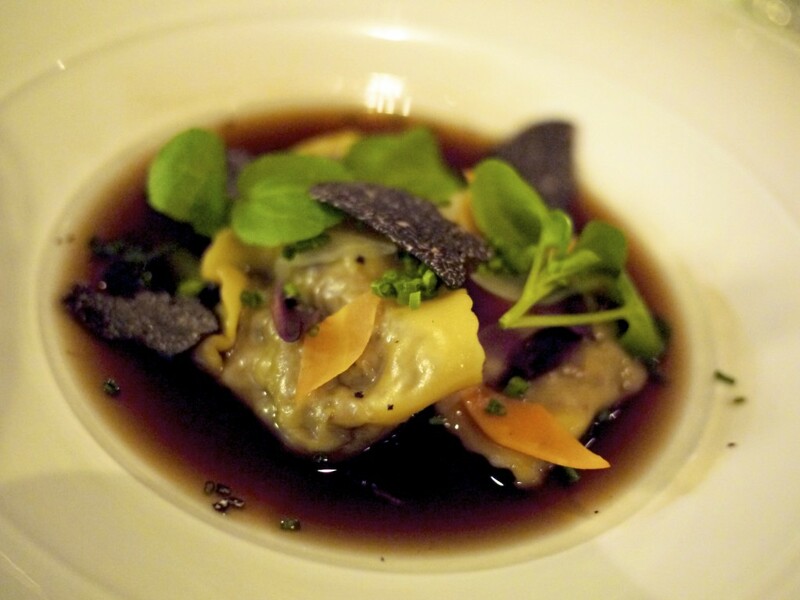 Again the flavours were extremely well balanced although it did not have the wow factor of my dish. 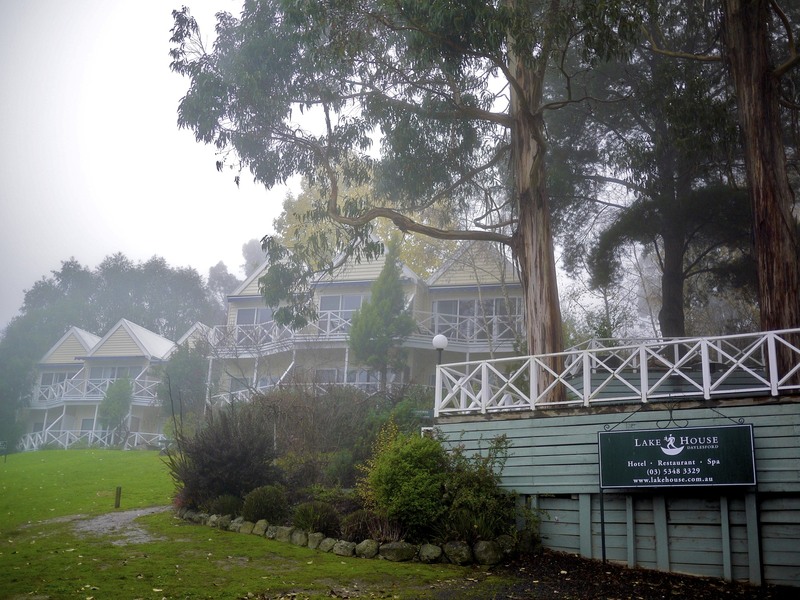 The food at Lake House was undeniably good and the restaurant certainly sets the bar for charming country side restaurants in Australia. 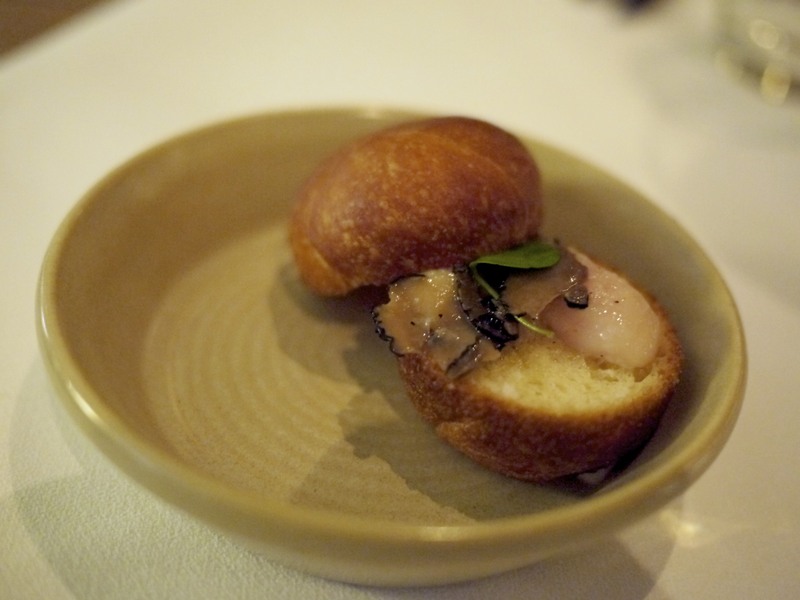 What I personally enjoyed, other than the food, was the relaxed atmosphere in the dining room, absent of any pretense, and whilst the food tried to be contemporary, I found the flavours to be comforting and rather familiar, though that was not a bad thing at all. The one thing that was missing that evening was perhaps the backstory to the producers and farmers that contributed to each dish, for I was led to understand that locality and seasonality was at the centre of Wolf-Tasker’s food (albeit some limited information being available on the menu itself). 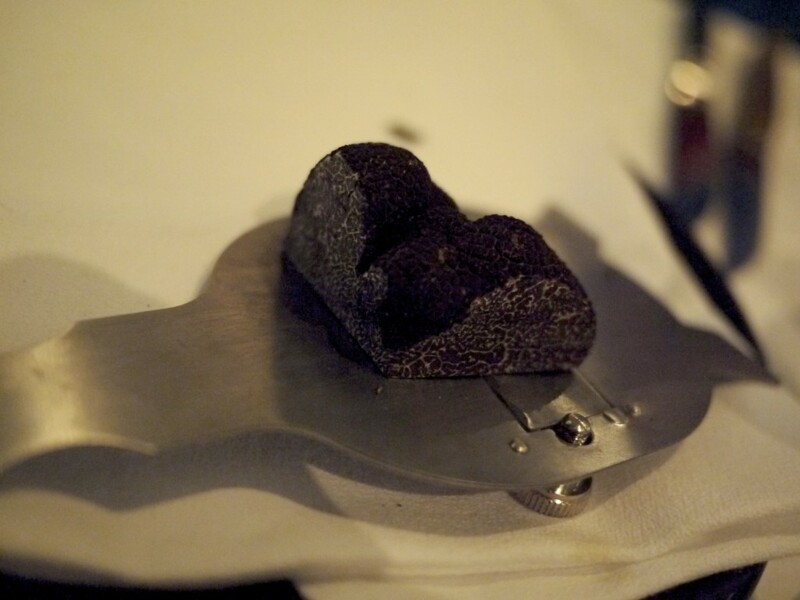 This entry was posted in Australia and tagged Alla Wolf-Tasker, Black Truffle, Cobaw Ridge, Daylesford, Gourmet Traveller, Lake House, Rkatsiteli on June 22, 2014 by admin.